I wasn't sure I should write about this as it's not directly related to cancer. But, I don't have a regular post for today so figured I'd entertain you with my sad little story. Thursday, September 10th was my 15th wedding anniversary. My saintly husband surprised me with a lovely diamond ring. It was particularly meaningful because it was a three stone diamond in a unity setting - one of those "past, present, and future" rings. Whether you buy into the marketing hype or not, that is now the meaning of the three stone setting for most people, including my husband. I know he wanted to give me something lovely to show he loved me and to demonstrate he believed we would, indeed, have a future together. You can't really see it in that picture but the setting is white gold intertwining the diamonds which makes the past, present, future even more meaningful. All girls love diamonds but I also was touched by the hopeful symbolism. We were going out to dinner on Saturday to celebrate and I wanted to wear my ring. We all know what this treatment is going to do to my physical appearance and energy level (which has already declined dramatically), and I was feeling that this was my last time to go out with my husband, looking like me, being alone with him in a restaurant as a "whole" woman without physical problems. Wearing the ring before I began treatment and got sick was important to me. I'm a girl, we get stupid about stuff like that. The place he purchased the ring (Fred Meyer) is located in Arden Fair mall, where it's hard to park and often crowded on Friday nights and weekends. They told my husband that resizing it would take a week. Given that I was too tired and in pain on Friday to brave the crowds to drop it off, and knowing that I wouldn't be able to wear it for our big night out if I did take it there, I decided to go elsewhere. My greatest failing in life is impatience, and I really didn't want to wait a week for Fred Meyer to do the work: it was important to me that I get to wear that ring once, at my best and healthiest. It wasn't only important to me - my husband wanted me to wear it too and have that memory. So, I went to a small, one man shop located in Country Club Plaza to get it resized. That's a dying mall, always empty, maybe only ten stores left in it. Gottshalks was an anchor store and had closed down, and every other store near them had also folded. Only one remained: Pete's Jewelry Repair. A year ago I'd taken a simple ring to Pete's Jewelry Repair inside the mall for resizing, and been happy with the results. He also has a "while you wait" policy, which meant I could wear the ring out to our anniversaary dinner. The mall is very close to my house so no parking problems or lengthy wait. Off I went. Pete has a quirky personality. I remember a year ago he discussed these little airplanes and things he likes to make out of gold. He describes himself as a jewelry artist, so I felt confident he could size this ring. I walked in to the empty store and asked him if he could size it right then, and he looked at it and said, "Sure." I asked him how much it would cost, and he said "$100.00." Well, I had to think about that - did I really want the ring that bad? I really am impatient, but not completely stupid, so I was about to say "sorry" and leave when he said, "Just kidding, it'll be $20.00." I give the go ahead, and sit down on a stool in his shop. He begins the resizing process, and I asked him if he could make rings larger too. I have a ring I am currently wearing on the finger I plan to wear the new ring, and I thought maybe I could put it on my index finger. Again, he says "sure" so I ask if he can use the gold from the ring he is resizing, and he said no. But then he handed me the gold. I guess he thought I was asking for the gold? Last time I'd been there he had not given me the gold, and it never occurred to me to ask. This ring was a 7 1/2 and I'm going down to a 4 so it was a quarter inch piece of gold. I tucked it in my purse and we sat there and chatted a bit. He asked me if I meditate. Now, this might come as a shock to those of you who live in the midwest, but not all Californians meditate. Not even those with cancer. So, I tell him no, but I admire the fact that he did. He told me I should and then pulled out his cell phone and showed me a picture of the sea and some chairs that looked like a Corona commercial, and said that this is where he "goes" when he meditates. I make some noise about how nice that is and maybe I should try it, and then I browse some catalogs so he can concentrate. Suddenly I hear him say, "Uh oh. Your stones just came out, I'll need to reset it. It will take another day." I was disappointed but still trusting. I told him fine, but I really wanted to wear it the next night as I had a special event, and was he sure it would be ready? He said, "Oh yes, I'll come in early just to be certain. Come back at 4:00"
He gave me a claim check, and I left. The next day I went back promptly at 4:00. Pete looked up when I came in and asked how he could help me. "Oh, your stones fell out when I was trying to resize it, and I need to reset it. I need more time." He pointed at the ring, which sat in the exact same place on his table that he'd left it yesterday. Confused, I told him I know that, I'd been sitting right there; it had happened in front of me, and that it was supposed to be ready at 4:00. He seemed surprised that he'd told me 4:00 and said harshly, "well, it's not ready, you'll have to come back tomorrow." His tone surprised me and I got upset. "That's not acceptable. I told you that I had a special event tonight that I was going to wear it for, and you said it would be ready by now." He looked at me, and then said, "Okay, come back at 5:00 and it'll be done." Our reservations were at 7:00. I wasn't dressed, and it takes 30 minutes to get downtown, so I needed to be ready by 6:30. Sadly, the older I get the longer it takes me to get presentable, especially when I have to wash and dry my hair, so I was concerned about the shortened time, but what else can I do? I accepted. I did say, "You are sure it will be done by 5:00, right?" I knew I couldn't wait until 6:00 and get ready. So, I walk down the mall to Macy's and walk around. It was a cool night, and I figured I might find a sweater. My friends had bought me some hot shoes I'd posted about before, and I also wanted to wear those shoes as a symbol of their caring about me. I was wearing them with a LBD and didn't have a sweater to match. I did find one, on sale too, only $9.00, so I went back early about 4:45. I figured I'd wait with Pete. And, the store was shuttered and dark. He'd left. If he couldn't do it, all he had to do was apologize and say it was impossible, the job was more complicated than he'd originally thought, and would take longer than an hour. But, he didn't say anything like that, he told me to come back in an hour and then closed up shop. A jeweler did that! Somebody who handles expensive and sentimental items and is automatically in a position of trust. Because of that behavior, first pretending not to know me and then lying to me about when it would be done, I got extremely concerned. I went home and called the mall management to complain but nobody was there. My husband was in shock too, and it was then that I realized I'd probably made a huge mistake. I asked my husband to show me the paperwork from the purchase and yep, I'd violated any warranty by taking it there to be resized. That had never even occurred to me. There was nothing to do but get dressed and go out to dinner. And, we had a nice time, but I have to tell you, talking about cancer and somebody maybe stealing our ring really did kind of put a damper on our nice time. We decided that the next day, we'd get the ring in whatever condition it was in and have Fred Meyer resize it and beg forgiveness and pay whatever they were going to charge. Which, I imagined would now be $100.00, like Pete had first quoted me. Pete's behavior had been so strange - pretending he didn't know me, shutting down his shop, that I didn't want to go alone to get the ring, so I took my husband and oldest son. Plus, I was pretty angry and I wanted them as a calming presence. I told him with quite a bit of disdain, that telling me the ring would be done in 45 minutes and then closing up shop was a slimeball move, and if he had damaged this ring in anyway I would be asking him to pay. The only words he said to me was, "I'm not arguing with you." but he wasn't saying it in an appeasing way, it was more in a get the hell out of my store way. I reminded him he hadn't argued with me yesterday either - he'd told me to come back and get the ring and then locked his shop and if that's the kind of way he runs his store it was the most unprofessional thing I'd ever seen. I turned to the women who had come in behind me and warned them not to leave anything valuable. I explained what happened to the Assistant Manager at Fred Meyer. She took one look at it and said that she'd never seen anything like that before. The jeweler wasn't there, so she would have him look at it and give me a call the next day. As promised, the next day, the jeweler called and told me that it was the worst hack job he'd ever seen. 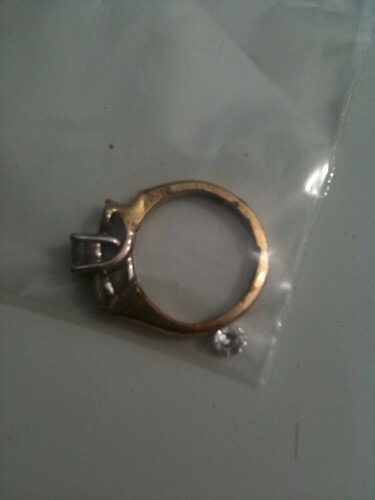 The ring was completely destroyed and the diamonds would have to be put in a new setting entirely. He had also checked with another jeweler for a second opinion, and that jeweler agreed. Apparently, the gold had been melted to 1600 degrees. Get ready for the next statement: $1036.00 for the new setting! I wanted to cry and trust me, I'm no crier. I told them I would have to try and get it out of the jeweler who wrecked it since we couldn't afford that, and probably through small claims. A few hours later the manager called me back, and offered me a "special accommodation" price to encourage the jeweler to pay me. He would charge cost, $691.00, if the guy would pay cash up front. If we had to put it on our card and then sue to retrieve it, then it was back to the thousand dollar price, which is what they would charge off the street. They did fax me a letter saying it had been destroyed and by the jeweler, Petru Colfescu, and that's all I need for court. We decided to take the letter to Pete and see if he would pay, but he has shut down his store due to the "flu" according to a note on the door. After four days of his store being closed, I found his home address and we sent a demand letter, certified mail. I'm quite certain that any guy who would tell a customer to come back in 45 minutes and then lock up and disappear once she rounds the corner has no desire to pay for damages he caused, so we'll almost certainly have to take him to court. And, by that time, I'll undergoing chemo and bald. I can't imagine facing a judge and a roomful of people looking like that, if I even have the energy and health to do so. It's one thing to be like that among friends and family who know what you are going through. Going to court like that and standing up and speaking - in my mind - would be awful. Pity is something I will never, ever accept. Could the timing be any worse? All my husband wanted to do was give me something beautiful that symbolized our life together and our hope for a future - and this guy has to ruin it. Unfortunately, you can't sue for that. What an amazing douchebag this "Pete" must be! Hard as it would be to deal with this in court, the story you've laid out here and what you are currently going through might have a considerable impact on a jury that heard it. I'm not talking about pity as you mentioned, but legitimate outrage at being cheated and lied to. Did the ring ever get fixed by the original store? I hope so. If you'd like to email me at wbjewelry at hotmail dot com, I will send you a little gift to help ease any post traumatic jewelry disorder you may still be experiencing!